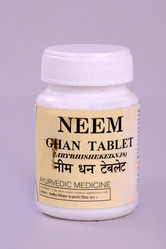 We are dealing in Neem Ghan Vati or Azadirachta indica powder. The Neem Powder take out from seed kernels features the highest concentrated proportion of Azadirachtin. AayurMed cultivates, sources, supplies and export Azadirachta Indica (neem) for last 30 years across the globe. Our Azadirachta Indica (neem)is used for various medical and cosmatics purpose. possessed of many and great virtues, this native indian tree has been identified on five-thousand year old seals excavated from the indus valley civilization. India’s earliest societies used margosa or neem leaves to exorcise the spirits of the dead. A tall perennial tree found in the tropical parts of the country, most parts of the tree are found to be useful.